Key to your business presentation skills is your ability to adapt to each speaking opportunity. Plus a means to get the most from your previous presentations. You don’t want to repeat your previous material. But it’s also true to say that no two presentation events are truly alike. So you should really know how to edit your presentation to stay on top. You have a different presentation audience. Business needs and expectations have changed. You don’t want to be “typecast” as a presenter. Perhaps, you want to use a new introduction. You want to have a new conclusion. Do you have a new case study? So, it’s true they are all valid reasons. But when you have the business need to edit your material you don’t want to over-do the changes. Too many changes and you might as well start again—and say goodbye to all your earlier hard work. You need to know how to edit your presentation and still be successful. The skill is to change no more than some 5% of your presentation material. Any more and you will not be familiar with your new presentation content. Below the 5% change figure and the material is different but you are familiar with it. Edit your presentation only slightly. You can easily cope with a small (5%) change to your presentation. Edit too much and your comfort zone changes. Then you have to practise and rehearse all over again. Is there any science behind the 5% edit figure? Yes. It highlights a comfort zone. Beyond this level of change and you have to re-create your material comfort zone. And at the same time invest more time and effort…and time is often in short supply. Just think how you could improve this consumer packaged goods presentation with some edits. You can maximise your speaking opportunities with some editing skills. 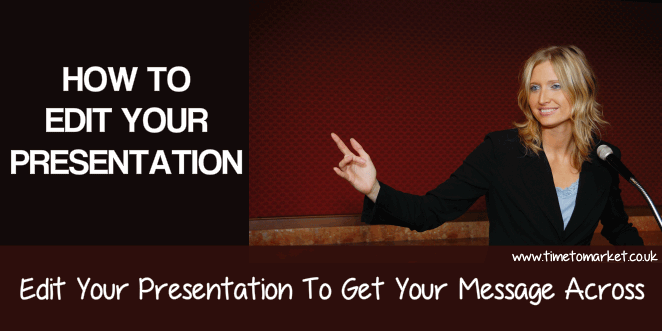 Change your existing presentation to suit the audience, time and place. And then focus on presentation rehearsal and execution. When you know how to edit your presentation you’ll become a more confident presenter. For more skills tips, you can always attend a corporate presentation training course held at one of our 40 training centres or your own offices.